Refried beans can be a healthy food or an unhealthy food -- preparation makes all the difference. Refried beans prepared with animal fat can be high in cholesterol and saturated fat, while beans fried with a small amount of olive or canola oil can be relatively low in fat and cholesterol free. When they're cooked with nutritious ingredients and little or no added salt, refried beans are a healthy way to add protein, fiber and complex carbohydrates to your meals. When you're shopping for commercially prepared refried beans, read the nutrition facts labels carefully. Though most canned beans offer abundant fiber, protein, potassium, iron and other essential nutrients, refried beans vary in the amount of fat, cholesterol and sodium they contain. Data from the U.S. Department of Agriculture shows that one brand of traditional-style beans has 217 calories, 3 grams of fat, 13 grams of protein, 12 grams of fiber and 1,069 milligrams of sodium per 1-cup serving. Another brand has 336 calories, 16 grams of fat, 12 grams of protein, 11 grams of fiber and 874 milligrams of sodium per cup. Both brands offer protein, fiber and other essential nutrients, but one brand is significantly higher in fat. Refried beans and other legumes are rich in complex carbohydrates, protein, potassium, iron, magnesium and folate. Refried beans provide both insoluble and soluble fiber, both of which play important roles in your digestion and absorption of food. For vegetarians and people who are trying to cut back on red meat, refried beans provide both protein and iron, a mineral that your body uses to transport oxygen through your bloodstream. 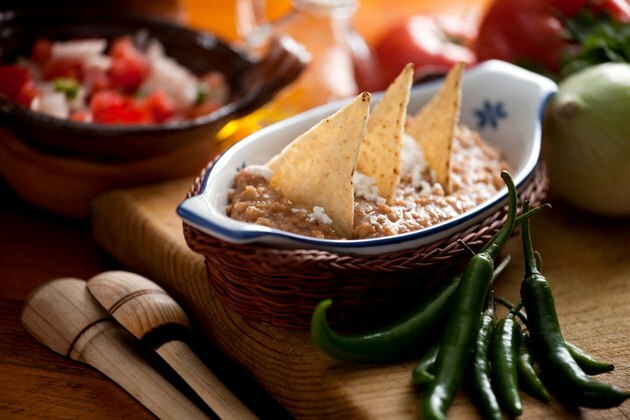 Refried beans are also a good source of potassium, an electrolyte that helps maintain normal blood pressure. Dried beans have a low rating on the glycemic index, or GI, a tool used for estimating how dramatically a food will increase your blood sugar. Refried beans are high in soluble fiber, a type of fiber that slows the digestion of carbohydrates and reduces their impact on your blood sugar. Emphasizing low-GI foods in your diet may help you maintain a healthy weight by controlling your appetite and delaying hunger, the Glycemic Index Foundation notes. Making your own refried beans can be quick and easy, according to the American Diabetes Association's "Diabetes Forecast," and it may be the best way to ensure that your beans are low in fat and sodium. Drain and rinse canned pinto, red or black beans to remove extra sodium, then mash beans coarsely and mix with cilantro, garlic, chili powder and cumin. Heat mashed beans with chopped onions in 1 tbsp. of olive oil for a heart-healthy, low-fat recipe. One serving has 80 calories, 2.5 grams of fat, no trans fat or cholesterol, 4 grams of protein and 4 grams of fiber, according to "Diabetes Forecast." Eating refried beans or other legumes in place of meat two or three times a week can reduce the amount of saturated fat and cholesterol in your diet. For a light Mexican-style dinner, serve refried beans with corn tortillas, steamed broccoli and fresh tomato salsa. The vitamin C in the broccoli and tomatoes will help your body absorb the iron in your refried beans.